WILMINGTON – Wilmington Fire Department officials will soon formally seek support to buy technology that would help clear the way for firetrucks at busy intersections. It is with great sadness to inform everyone of the passing of Carl Regutti, friend and colleague with a vision of capturing the true essence of North Carolina’s fire service and preserving it in life-sized bronze. Carl passed away this morning after a lengthy battle with cancer. BLADEN COUNTY – Residents of the Rowan Community near Kelly will be able to sleep a bit easier with a new fire district being established. 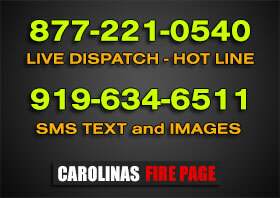 NASH COUNTY – Shortly after 01:30 hours on April 28th, Nash County 911 began receiving calls for a dwelling fire in the 5300 block of Red Oak-Battleboro Road. MITCHELL COUNTY – Hundreds of emergency response personnel spent this past weekend responding to an imagined earthquake during chilly, wet weather. The Atwell Fire Department and Enochville Fire Rescue conducted a live training burn on Saturday, April 27. BURKE COUNTY – Funeral services will be held at 3:00 p.m. Wednesday, May 1, 2013 at Burkemont Baptist Church. The family will receive friends Tuesday evening from 5:00 until 8:00 p.m.